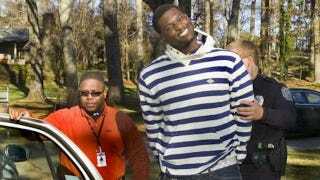 When we put out the call last week for photoshops of the fantastic perp walk photo of Oakland Raiders linebacker Rolando McClain (above), we knew you'd be up to the challenge; we knew you'd make us laugh like all hell at the sheer absurdity of it all. And you didn't disappoint. In all honesty, I was a little overwhelmed by the volume of responses—more than 100 in all, which I had to narrow down to the 25 you see here. If you didn't make the cut, don't take it personally; I had to limit it at some point, and it really wasn't worth wasting too much time on the effort, given how stupid an exercise this was. Away we go. Nathan1991 went right for the Jerry Sandusky angle. While Rob H. put McClain with Sandusky's attorney, lawyerin' Joe Amendola. siameesecities took the Back to the Future route, complete with commentary from Doc: "Pretty Mediocre photographic fakery, they cut off your Rolando's arms." Cosmo Kramer made McClain a Black Panther—and a happy one, at that. One of Rembrandt's self portraits looks a lot like McClain to Blooper Nova. Greg R. kills two memes with one photoshop by blending Cigar Guy with our boy Rolando. Remember The Cosby Show? pavlovsdog00 does. McClain went to Alabama, but Darrell D. shows us how much McClain fits right in as a Dookie. We got a few Hamburglar memes, but the first—and the best—came courtesy BobbyKnightChairToss. Led Zeppelin's Houses of the Holy will never sound the same, given what FreemanMcNeil did to the album cover here. The Most Interesting Man In The World is really Rolando McClain, according to Brian S.
We all loved that video of old guys Joe Kapp and Angelo Mosca throwing down a few weeks back, canes and wheelchairs and all. Now imagine it with Rolando McClain instead. That's what Joel W. did. McClain abides, courtesy Brendan L.
Andrew N. said he had a dream he would win the contest. He'll have to settle for making the cut. We received numerous Occupy Wall Street submissions, but Rene T.'s was one of the best. And Wiley M.'s was even better. Will you bloody cover yourself, Old Bean? By FrailBlazers, a past winner. Here's to you, Mrs. Robinson. By Mantis Toboggan, M.D. Raiders fans wondering where McClain is needn't worry. He's off to see the wizard, thanks to Mr. Rodgers Neighborhood. Elvis, "Jailhouse Rock," featuring Rolando McClain on backing vocals. By Rusty Shackleford. You're probably still not tempted to buy a pair of Uggs, but you have a whole new appreciation for Tom Brady's ad campaign now, thanks to iblogmylunch. Who knew that as Al Cowlings drove that white Bronco with O.J. in the backseat that Rolando McClain was riding shotgun, fantastic grin and all? Adam S. did, that's who. This wasn't in the comments of the original post, so I didn't see it until a few minutes after this post went live, but Samer Ocho Cinco probably would have won had his mashup of McClain and 76ers mascot candidate Phil E. Moose been where I requested the entries go. I mean, just look at that. See if you can spot McClain wherever Aaron P. put him. Now see if you can find him with what Donnie_Iris did in our runner-up entry. And our winner, for no reason other than it made me laugh the hardest because it's Diff'rent Strokes, is by Kevin Q. Kevin, send us an email at tips@deadspin.com to claim your prize. And thanks for all the submissions, everybody.